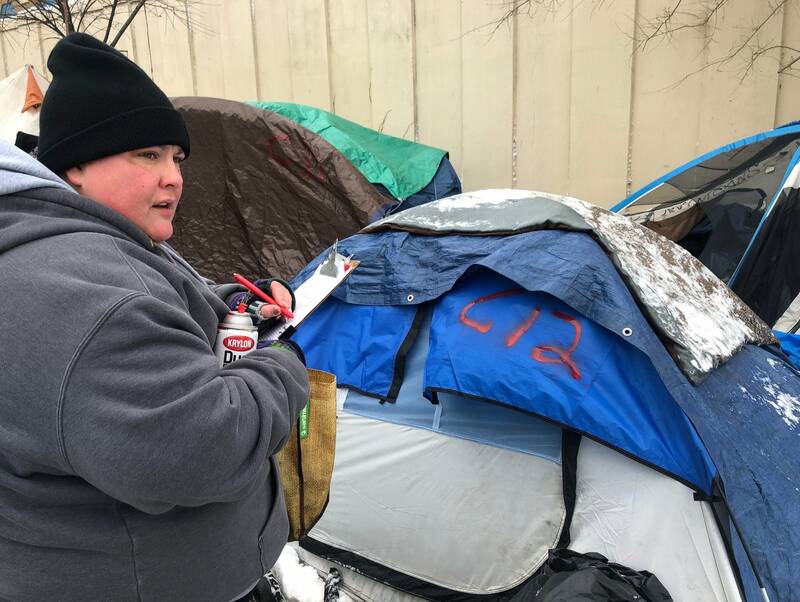 The city of Minneapolis and its partners are rushing to open an emergency shelter on Dec. 12 for people living in tents along Franklin and Hiawatha avenues. But even with the tentative opening date just 10 days away, there are at least three key questions vital to the effort's success that remain unanswered. 1) Will the structures be ready for people to live in? 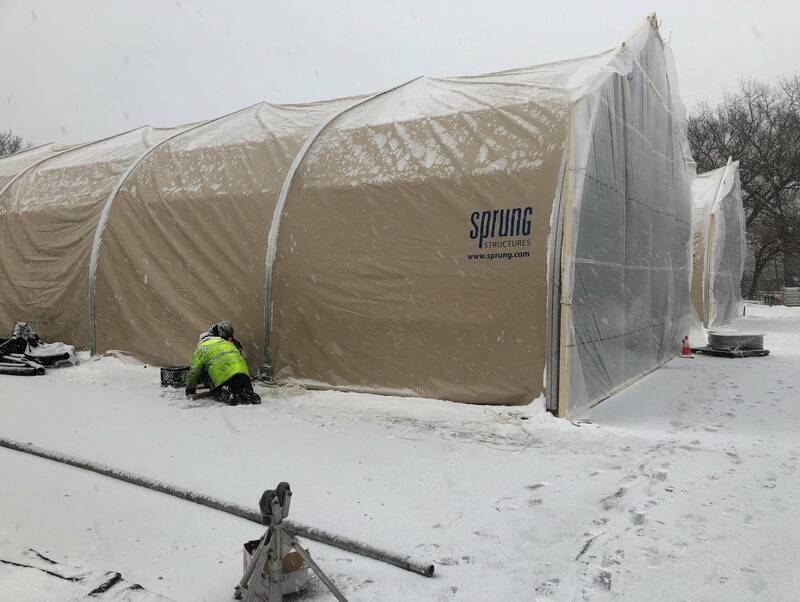 Construction crews worked through the weekend in the cold and snow to finish erecting the three massive, tent-like structures, which will serve as the so-called "navigation center," a type of low-barrier shelter never seen before in Minnesota. In October, the Minneapolis City Council approved spending $1.5 million to build the center on land near the homeless camp owned by the Red Lake Nation. At that time, the land still had several dilapidated, industrial buildings that needed to be torn down. Since then, the land has been cleaned up and black-topped for the pop-up structures. Those started going up last week, but don't yet look inhabitable. They still need floors, beds, storage lockers and other basics to house up to 120 adults and, potentially, their pets. 2) Will 120 beds be too many or too few? 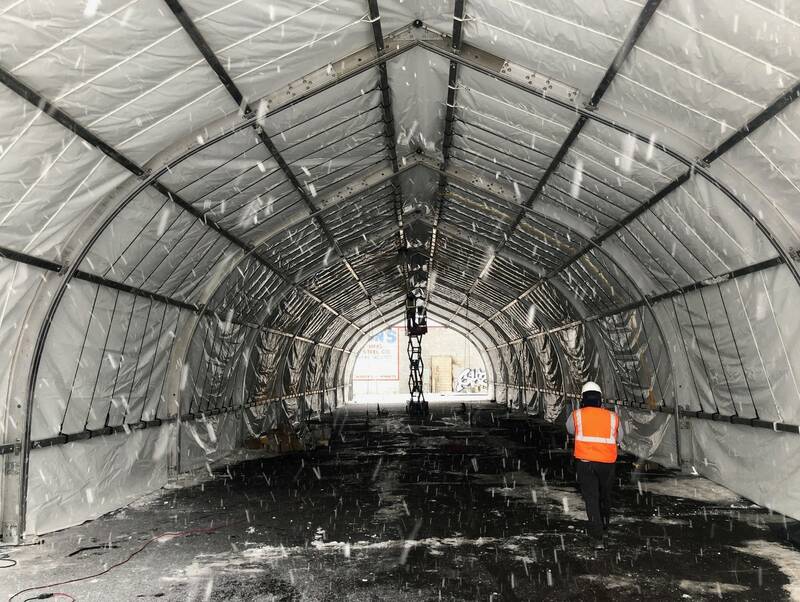 On the other side of the highway, more than 150 tents covered in tarps and snow line the concrete sound barrier dubbed the Wall of Forgotten Natives because the majority of residents are Native American. But nobody really knows how many people are actually living there. Some tents house multiple people. Others are used for storage or abandoned by those who've gotten housing or entered drug and alcohol treatment. The last survey of the encampment counted 191 people, but was completed two months ago. 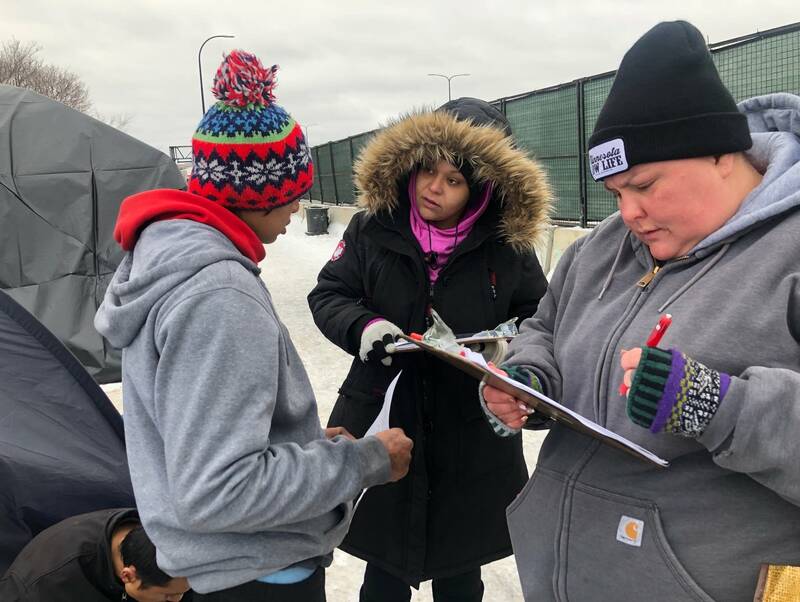 Over the weekend, outreach worker Jenny Bjorgo and several others with the Minnesota Indian Women's Resource Center went tent by tent, noting which ones looked abandoned and providing information to residents about the navigation center. Some had still never heard what was being built so quickly to replace the tents they call home now. "No, I don't know nothing. We hear rumors of what's going on. But I don't know," said Rob Greene, when asked if he would move to the navigation center. Greene recently moved to the encampment from where he usually camps on nearby park land. He says he doesn't like to be around other people because he has anxiety. Bjorgo showed the emergency shelter plans to Greene who took one look at them and said he wouldn't go. "When I first looked at it, the first thing I thought of was one of those [concentration] camps. I don't want to be part of no camp," Greene said. Many other residents were more receptive to the pitch, including Brittian Scott. "I used to be one of those guys, like 'I don't need anybody's help. I can do it by myself.' But being homeless put my humility in check ... I'm not afraid to ask for help. I'm not afraid to take help. I mean, I need everything I can get," said Scott, whose tent was destroyed last week by the second major fire at the encampment. Bjorgo and her co-workers also surveyed each person living in the encampment about their drug use, tribal affiliation if any, how much stuff they wanted to bring with them, and who they're living with. The information will help government and nonprofit agencies as they prepare to open the Navigation Center. But misinformation at the camp about the navigation center has made signing people up to move even more challenging. Maggie Thunder Hawk and her four adult children agreed to move, but she's begun to rethink if she'll actually go. "I really don't know yet, because I've heard a bunch of other stuff, and I don't really know what the hell is going on," Thunder Hawk said, alluding to rumors that the navigation center would be like a kind of prison for the homeless. "If my kids are OK with it and they want to go, then I'm going. And if not, then I can't." The city of Minneapolis plans to clear the encampment sometime after the navigation center is open, so Thunder Hawk will probably have to move somewhere else. 3) Who will provide security and what rules will there be? The shelter operations will be run by Minneapolis-based nonprofit Simpson Housing Services and funded by a philanthropic donor, according to multiple people familiar with the project. The cost of operations has not been made public. Employees of Simpson Housing have been stationed at a nearby service tent in the encampment to tell people about the navigation center and ask them to sign up to move there when it opens. So far, about 40 people have done so. "We're coming out whenever we can and just talking to people about the navigation center, asking them what they want out of shelter that they're not getting right now, who they need to come in with, what trouble they've had accessing other shelters, and getting them on a list to expect them when we open," said Marian Wright, who was recently tapped by Simpson Housing to manage the shelter portion of the navigation center. Wright has decades of experience working with homeless people. Like many people living at the encampment, she is Native American. Now, Wright must hire more than 30 people and define exactly what the rules will be, although she says the goal is to have as few rules as possible. For example, people will be able to come and go 24 hours a day and won't be turned away if they are under the influence of drugs or alcohol. However, using at the site won't be allowed. The challenge for her is to reach a population that has chosen not to use the shelter that's currently available because it feels unsafe or is too restrictive. "People that are staying in the encampment right now are people who have utilized traditional shelters in the past and it just didn't work for them, whether it was because of curfew times, check out times, a lot of barriers over sobriety. So we're hoping we can offer a very nontraditional shelter with not a lot of barriers, if not any," Wright said. The Red Lake Nation and the city of Minneapolis plan to contract with a security firm to keep the navigation center safe, although a specific company has not yet been identified or who will pay for it. The Native American Community Clinic will provide health care on-site along with Livio Health, which provides regular medical care in the encampment through a contract with the Red Lake Nation. Plans for the center also include buildings people can use for storage, and the Minnesota Indian Women's Resource Center plans to pay for additional storage off site. The best case scenario is that everyone finds a permanent place to live. There's been a concerted effort over the past two months by Hennepin County, the Red Lake Nation, and their nonprofit partners to get everyone at the encampment permanent housing or drug and alcohol treatment. Those efforts are starting to pay off. So far, more than 80 people have moved into housing, including 15 children. 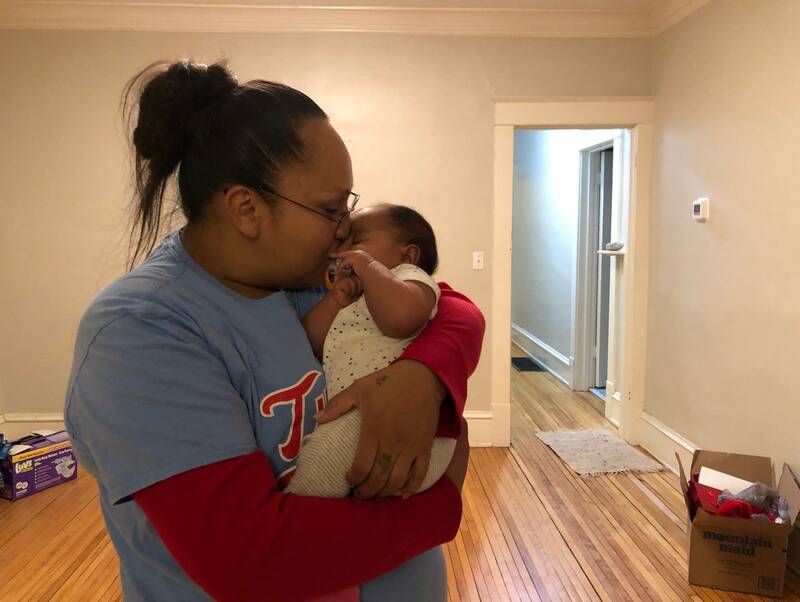 Nearly 20 moved into homes last Friday alone. One was Melody Johnson who picked up keys to a place for her and her two kids. Johnson has been homeless for the last year and even with a rental subsidy it took a while to find a place. "It is some hard work to find, especially if you got background stuff or whatever you got to worry about, rental history, not enough income," Johnson said. "But there is a light at the end of the tunnel."